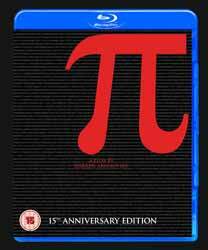 I've never understood why Darren Aronofsky's Pi had so much praise heaped upon it on its original release. It really is a load of self-indulgent nonsense. What is mildly interesting is that on such a budget ($60,000 / £39,000) anything at all was delivered. But what we do get isn't much to shout about. As a student, I remember sitting through some of my friends short films and most of them were head and shoulders above what is delivered here - so when I think of the number of critics who argued that Aronofsky created something truly visionary on practically no budget, I can't help but shake my head in dismay. It also left me with the feeling hat Aronofsky had seen Eraserhead and Wallstreet and then decided to use these movies as his main points of reference. The narrative is so laughably shallow that it appears to have been cooked up over a drunken evening. A mathematics genius discovers that there are patterns in the universe and, if this can be unravelled, will bring him some sort of enlightenment. So, he goes crazy, finds the pattern and then the Jews emerge and try and steal his secret formula... oh, wait... I may be getting that last part mixed up with an old Frosties advert? We round everything off by being hit over the head with notion that ignorance is bliss. I couldn't understand why this has been released on Blu-ray? From shot to shot the picture quality varies considerably and on Blu-ray it's so obvious as to be distracting. The sound is also so flat that if you own this already on DVD I can't think of one reason why you'd want to pick up the Blu-ray. For a 15th Anniversary edition I was expecting at least something new in the way of extras. I could be wrong, but from the look of things the extras are all from the DVD. Extras include an audio commentary with the director and another with Gullette; Deleted Scenes with commentary (4 min); Behind the Scenes Montage (8 min, 31 sec - with commentary); Theatrical Trailer (1 min, 15 sec); and a music video (2 min, 50 sec). It's not a movie that, if we're honest with ourselves, can be considered as in any way entertaining. Maybe the fact it was shot in black and white helps people think what they're viewing is art. Personally, I found it to be a lot of nonsense that attempts to be thought-provoking and original. The only thought it provoked in me, however, is "why am I wasting my time watching this self-indulgent nonsense?"